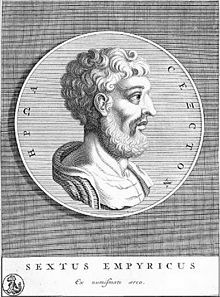 Sextus Empiricus (Greek: Σέξτος Ἐμπειρικός; c. 160 – c. 210 CE, dates uncertain), was a physician and philosopher, who likely lived in Alexandria, Rome, or Athens. His philosophical work is the most complete surviving account of ancient Greek and Roman Pyrrhonism. In his medical work, as reflected by his name, tradition maintains that he belonged to the empiric school in which Pyrrhonism was popular. However, at least twice in his writings, Sextus seems to place himself closer to the methodic school. He may have been the same person as Sextus of Chaeronea. Sextus Empiricus's three surviving works are the Outlines of Pyrrhonism (Πυῤῥώνειοι ὑποτυπώσεις, Pyrrhōneioi hypotypōseis, thus commonly abbreviated PH), and two distinct works preserved under the same title, Against the Mathematicians (Adversus Mathematicos), one of which is probably incomplete as there are references in the text to parts that are not in the surviving text. Against the Mathematicians I–VI is sometimes distinguished from Against the Mathematicians VII–XI by using another title, Against the Dogmatists ( Πρὸς δογματικούς, Pros dogmatikous) and then the remaining books are numbered as I–II, III–IV, and V, despite the fact that it is also commonly inferred that the beginning of such a separate work is missing and it is not known how many books might have preceded the extant books. The supposed general title of this work is Skeptical Treatises' (Σκεπτικὰ Ὑπομνήματα /Skeptika Hypomnēmata). Note that none of these titles except Against the Mathematicians and Outlines of Pyrrhonism, are found in the manuscripts. Because of these and other barriers to acquiring true beliefs, Sextus Empiricus advises that we should suspend judgment about virtually all beliefs; that is to say, we should neither affirm any belief as true nor deny any belief as false. This view is known as Pyrrhonian skepticism, as distinguished from Academic skepticism, as practiced by Carneades, which, according to Sextus, denies knowledge altogether. Sextus did not deny the possibility of knowledge. He criticizes the Academic skeptic's claim that nothing is knowable as being an affirmative belief. Instead, Sextus advocates simply giving up belief; in other words, suspending judgment about whether or not anything is knowable. Only by suspending judgment can we attain a state of ataraxia (roughly, 'peace of mind'). Sextus did not think such a general suspension of judgment to be impractical, since we may live without any beliefs, acting by habit. Sextus allowed that we might affirm claims about our experience (e.g., reports about our feelings or sensations). That is, for some claim X that I feel or perceive, it could be true to say "it seems to me now that X." However, he pointed out that this does not imply any objective knowledge of external reality. Though I might know that the honey I eat at a certain moment tastes sweet to me, this is merely a subjective judgment, and as such may not tell me anything true about the honey itself. Interpretations of Sextus's philosophy along the above lines have been advocated by scholars such as Myles Burnyeat, Jonathan Barnes, and Benson Mates. Because of the high degree of similarity between the surviving works of Sextus Empiricus and those of the Buddhist philosopher, Nagarjuna Thomas McEvilley suspects that Nagarjuna and Sextus Empiricus were referencing some of the same earlier Pyrrhonist texts in developing their works. Pyrrhonism is more a mental attitude or therapy than a theory. It involves setting things in opposition and owing to the equipollence of the objects and reasons, one suspends judgement. "We oppose either appearances to appearances or objects of thought to objects of thought or alternando." The ten modes induce suspension of judgement and in turn a state of mental suspense followed by ataraxia. If ever one is in a position in which they are unable to refute a theory, Pyrrhonists reply "Just as, before the birth of the founder of the School to which you belong, the theory it holds was not as yet apparent as a sound theory, although it was really in existence, so likewise it is possible that the opposite theory to that which you now propound is already really existent, though not yet apparent to us, so that we ought not as yet to yield assent to this theory which at the moment seems to be valid." These ten modes or tropes were originally listed by Aenesidemus. "The same impressions are not produced by the same objects owing to the differences in animals." The same impressions are not produced by the same objects owing to the differences among human beings. The same impressions are not produced by the same objects owing to the differences among the senses. Owing to the "circumstances, conditions or dispositions," the same objects appear different. These are "states that are natural or unnatural, with waking or sleeping, with conditions due to age, motion or rest, hatred or love, emptiness or fullness, drunkenness or soberness, predispositions, confidence or fear, grief or joy." “We deduce that since no object strikes us entirely by itself, but along with something else, it may perhaps be possible to say what the mixture compounded out of the external object and the thing perceived with it is like, but we would not be able to say what the external object is like by itself." "Based, as we said, on the quantity and constitution of the underlying objects, meaning generally by "constitution" the manner of composition." So, for example, goat horn appears black when intact and appears white when ground up. Snow appears white when frozen and translucent as a liquid. "Since all things appear relative, we will suspend judgment about what things exist absolutely and really existent. Do things which exist "differentially" as opposed to those things that have a distinct existence of their own, differ from relative things or not? If they do not differ, then they too are relative; but if they differ, then, since everything which differs is relative to something..., things which exist absolutely are relative." "Based on constancy or rarity of occurrence." The sun is more amazing than a comet, but because we see and feel the warmth of the sun daily and the comet rarely, the latter commands our attention. "There is a Tenth Mode, which is mainly concerned with Ethics, being based on rules of conduct, habits, laws, legendary beliefs, and dogmatic conceptions." I: that based on the subject who judges (modes 1, 2, 3 & 4). II: that based on the object judged (modes 7 & 10). An influential Latin translation of Sextus's Outlines was published by Henricus Stephanus in Geneva in 1562, and this was followed by a complete Latin Sextus with Gentian Hervet as translator in 1569. Petrus and Jacobus Chouet published the Greek text for the first time in 1621. Stephanus did not publish it with his Latin translation either in 1562 or in 1569, nor was it published in the reprint of the latter in 1619. Sextus's Outlines were widely read in Europe during the 16th, 17th and 18th centuries, and had a profound effect on Michel de Montaigne, David Hume, and Georg Wilhelm Friedrich Hegel, among many others. Another source for the circulation of Sextus's ideas was Pierre Bayle's Dictionary. The legacy of Pyrrhonism is described in Richard Popkin's The History of Skepticism from Erasmus to Descartes and High Road to Pyrrhonism. The transmission of Sextus's manuscripts through antiquity and the Middle Ages is reconstructed by Luciano Floridi's Sextus Empiricus, The Recovery and Transmission of Pyrrhonism (Oxford: Oxford University Press, 2002). Since the Renaissance French philosophy has been continuously influenced by Sextus: Montaigne in the 16th century, Descartes, Blaise Pascal, Pierre-Daniel Huet and François de La Mothe Le Vayer in the 17th century, many of the "Philosophes," and in recent times controversial figures such as Michel Onfray, in a direct line of filiation between Sextus' radical skepticism and secular or even radical atheism. Sextus is the earliest known source for the proverb "Slowly grinds the mill of the gods, but it grinds fine", alluded to in Longfellow's poem "Retribution". ^ Berry, Jessica (2011). Nietzsche and the Ancient Skeptical Tradition. Oxford University Press. p. 230. ISBN 978-0-19-536842-0. ^ Stanford Encyclopedia of Philosophy. "Sextus Empiricus". Retrieved 29 May 2015. ^ Sextus Empiricus. Outlines of Pyrrhonism trans. R.G. Bury (Loeb edn) (London: W. Heinemann, 1933), p. 283. ^ The extent to which a skeptic can hold beliefs as well as the kinds of beliefs a skeptic can have is a matter of scholarly dispute. ^ See PH I.3, I.8, I.198; cf. J. Barnes, "Introduction", xix ff., in Sextus Empiricus, Outlines of Scepticism. Julia Annas and Jonathan Barnes (transl.) (Cambridge: Cambridge University Press, 2000). ^ Burnyeat, M., "Can The Sceptic Live His Scepticism" in Myles Burnyeat and Michael Frede (ed. ), The Original Sceptics: A Controversy (Hackett, 1997): 25–57. Cf. Burnyeat, M., "The Sceptic in His Place and Time", ibid., 92–126. ^ Barnes, J., "The Beliefs of a Pyrrhonist" in Myles Burnyeat and Michael Frede (ed. ), The Original Sceptics: A Controversy (Hackett, 1997): 58–91. ^ Mates, B. The Skeptic Way (Oxford UP, 1996). ^ Frede, M., "The Sceptic's Beliefs" in Myles Burnyeat and Michael Frede (ed. ), The Original Sceptics: A Controversy (Hackett, 1997): 1–24. Cf. Frede, M., "The Skeptic's Two Kinds of Assent and the Question of the Possibility of Knowledge", ibid., 127–152. ^ Bican Şahin, [Toleration: The Liberal Virtue], Lexington Books, 2010, p. 18. ^ Richard Popkin (editor), History of Western Philosophy (1998) p. 330. ^ Recent Greek-French edition of Sextus's works by Pierre Pellegrin, with an upbeat commentary. Paris: Seuil-Points, 2002. This article incorporates text from a publication now in the public domain: Chisholm, Hugh, ed. (1911). "Sextus Empiricus" . Encyclopædia Britannica. 24 (11th ed.). Cambridge University Press. p. 751. Sextus Empirucis, Esquisses Pyrrhoniennes, Greek text and French Translation, under the editorship of Pierre Pellegrin (Paris: Seuil-Points, 1997). Sexti Empirici Adversus mathematicos, hoc est, adversus eos qui profitentur disciplinas, Gentiano Herveto Aurelio interprete, Parisiis, M. Javenem, 1569 (Vicifons). Brochard, Victor, Les Sceptiques grecs (1887) reprint Paris: Librairie générale française, 2002. Jourdain, Charles, Sextus Empiricus et la philosophie scholastique, Paris: Paul Dupont, 1858. Janáček, Karel, Sexti Empirici indices, Firenze: Olschki, 2000. Janáček, Karel, Studien zu Sextus Empiricus, Diogenes Laertius und zur pyrrhonischen Skepsis. Hrsg. v. Jan Janda / Filip Karfík (= Beiträge zur Altertumskunde; Bd. 249), Berlin: de Gruyter 2008. Mates, Benson, The Skeptic Way: Sextus Empiricus's Outlines of Pyrrhonism, Oxford: Oxford University Press, 1996. Pappenheim Eugen, Lebensverhältnisse des Sextus Empiricus, Berlin, Nauck, 1875. Perin, Casey, The Demands of Reason: An Essay on Pyrrhonian Scepticism, Oxford: Oxford University Press, 2010. Vazquez, Daniel, Reason in Check: the Skepticism of Sextus Empiricus, Hermathena, 186, 2009, pp. 43–57. Morison, Benjamin. "Sextus Empiricus". In Zalta, Edward N. (ed.). Stanford Encyclopedia of Philosophy. The complete works of Sextus Empiricus in Greek (at Google Books). Sexti Empirici opera recensuit Hermannus Mutschmann, voll. 2, Lipsiae in aedibus B. G. Teubneri, 1912.